"Hola! 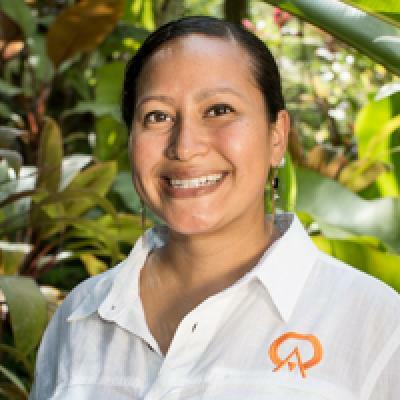 I'm Gema, and I've been a part of Anywhere Costa Rica since 2006 — I've been involved in the Tourism Industry over a decade. As a reliable and passionate person, I love planning trips to our beautiful country. It means I not only have the opportunity to educate travelers about all of the options they have but, also help them experience the best of Costa Rica. One of my favorite destinations is Costa Rica's Osa Peninsula — it is a unique place on the South Pacific Coast that everyone should see at least once (exuberant rainforest, wildlife, and a peaceful environment). I'm so passionate about travel that I've even managed to put my professional skills to use outside of Anywhere by coordinating volunteer service for young travelers — an independent initiative to contribute to community growth and development. The community service is 'ad honorem;' the primary goal is to create a positive impact through small changes. Working at Anywhere has been a great journey. Come and visit us, I'd love to help you experience the warmth of our people, and get immersed into the local culture." Absolutely the best and the most professional online service available! Gema was great! She helped us both prior to our arrival and during our trip. Thank you! Thanks for arranging our transportation. It worked so smoothly. Our tour arranged by you for the Manuel Antonio park was also superb. Gema was amazing. She always answered within a good amount of time, and she answered all of my questions about the country and the trip. I am so happy she was paired with me. She made our trip great ! It was a great experience. Gema was very helpful in planning our trip based on what information I gave her and on the short time restraint we had in getting it organized and booked. The hotels, excursions, and transport were outstanding. You were very responsive, easy to get in touch with when we were planning our trip via text and phone, and seemed very knowledgeable about the places you recommended. The recommendations you made were excellent. We had a great trip, and it was stress free. Thank you!! Gema was the best. She was responsive, informative and prompt. Thank you for everything. Your service exceeded my expectations and made for a very pleasant trip. Everything was really good. We got to see so many nice places. Thanks! Gema did a wonderful job and was always very responsive to any questions we had. I never felt like I didn't know what was going on or where I was supposed to be. Hi Gema. You did an excellent job planning and monitoring our vacation. Thank you. Gema was great! The quick responses were very impressive. Gema was great. Easy going and response time was excellent. Her suggestions for our trip were both great and helpful. Nice to have someone with so much knowledge to help you plan a trip. Anywhere did a fantastic job coordinating our transportation to and from SJO and La Fortuna. They also did an excellent job coordinating our daily tours and activities. I highly recommend there services. Thank you for planning our trip, we had a great time.